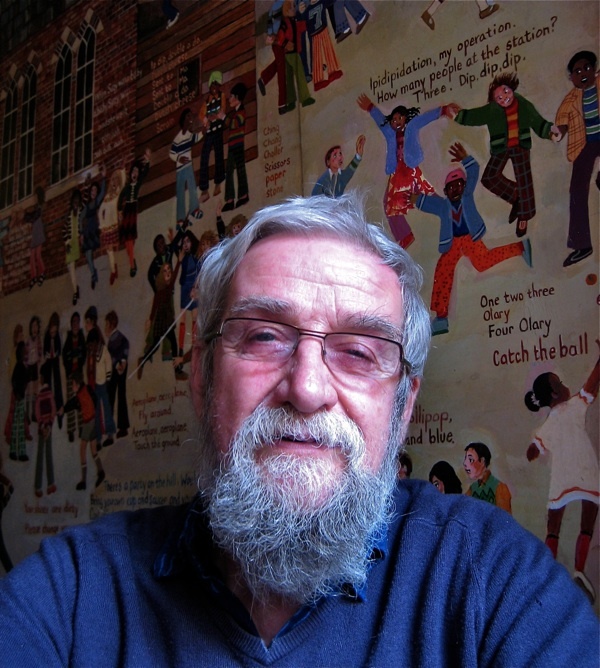 This is the amiable Dan Jones who has lived down in Cable St since 1967 and has made it his business to collect children’s rhymes, both here and all over the world since 1948. Dan has many hundreds in transcripts and recordings that are slowly yet inevitably converging into a book of around a thousand rhymes that he has been working on for some years entitled The Singing Playground which will be his magnum opus. He explained that the litany of classic nursery rhymes which adults teach children have barely altered since James Halliwell’s collection The Nursery Rhymes of England of 1842, when they were already old. In contrast, the rhymes composed and passed on by children are constantly changing and it is these that form the subject of Dan’s study. 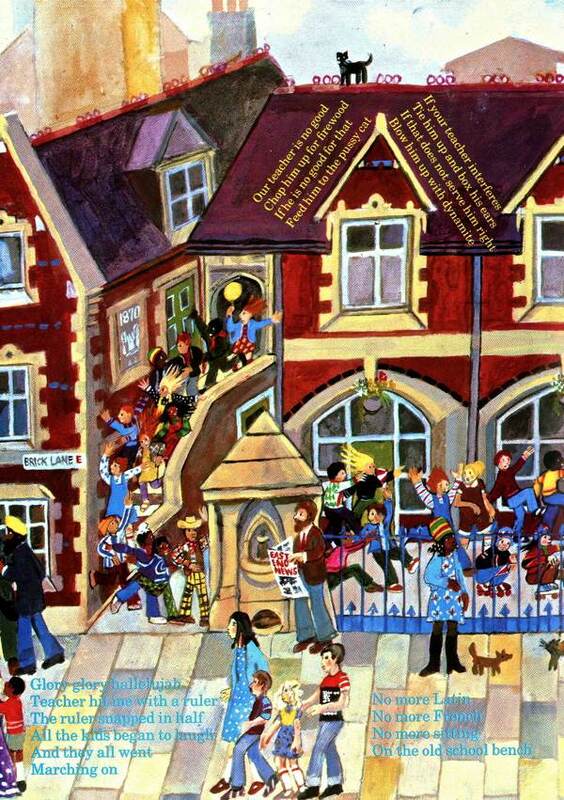 When you enter the bright red front door of his house in Cable St, you can barely get through the passage because of a huge mural painted by Dan of the playground of St Paul’s School, Wellclose Sq, that is about ten feet tall and twenty feet long. Painted on wooden panels, it is suspended from the wall and jutting forward, which puts you directly at the eye level of many of the children in the painting and, thus confronted, you see that all the figures are surrounded by rhymes. The effect is magical and one reminiscent of Breughel’s Children’s Games. As well as collecting rhymes, Dan is a painter who creates affectionately observed murals of children in school playgrounds, all painted in rich natural hues and with such levity and appreciation for the exuberant idiosyncrasy of childhood that I was immediately beguiled. I have always loved the joyful sound of the children playing in the school playground that I can hear from my house, but Dan has found a method to explore and celebrate the specific quality of this intriguing secret world through his scholarship and paintings. Once you get past the mural, you find yourself in the parlour lined with more paintings. Some even protrude from behind the comfortable armchairs, which are arranged in a horseshoe, like an old-fashioned doctor’s surgery, indicating that Dan lives a very sociable existence and that this room has been the location for innumerable happy gatherings over the last forty years he and his wife, Denise, have lived here. There are bookshelves brimming over with all manner of books devoted to art and social history, and children’s books on the coffee table for the amusement of Dan’s grandchildren, who wander in and out as we are talking. Rhymes spill out of Dan Jones endlessly and I could have sat all day hearing the fascinating stories of the origins of familiar examples and all their remarkable different versions over time and in different languages. Dan has a paradoxical quality of seeming both young and old at the same time. While displaying a fine white beard and resembling a patriarch in a painting by William Blake, he also possesses the gentle nature and spontaneous enthusiasm of youth. I can understand why children choose to line up in the playground to tell Dan their rhymes, as they do when he arrives in schools, and why old people too, when Dan puts on them on the spot asking “What rhymes do you remember from your youth?”, would summon whole canons of verse from the depths of their memories for him. The heartening news from the playground that Dan has to report is that the culture of rhymes is alive and kicking, in spite of all the distractions of the modern age. The endless process of repetition and reinvention goes on with ceaseless vigour. Most rhymes accompany action and melody, which means that while the words may change, other elements – especially the melodies - can remain constant over centuries or across continents in different languages and cultures, tracing the historical movements of peoples. Perhaps the most astounding example Dan gave me was Ching, chang, choller (paper, scissors and stone), a game used to select a random winner or loser, which was depicted in the tomb of a Pharoah four thousand years ago and of which there are versions recorded in ancient Rome, China, Japan, Mongolia, Chile, Korea,Hungary, Sweden, Italy, France and USA. Dan recorded it being played at Columbia Road Primary School. 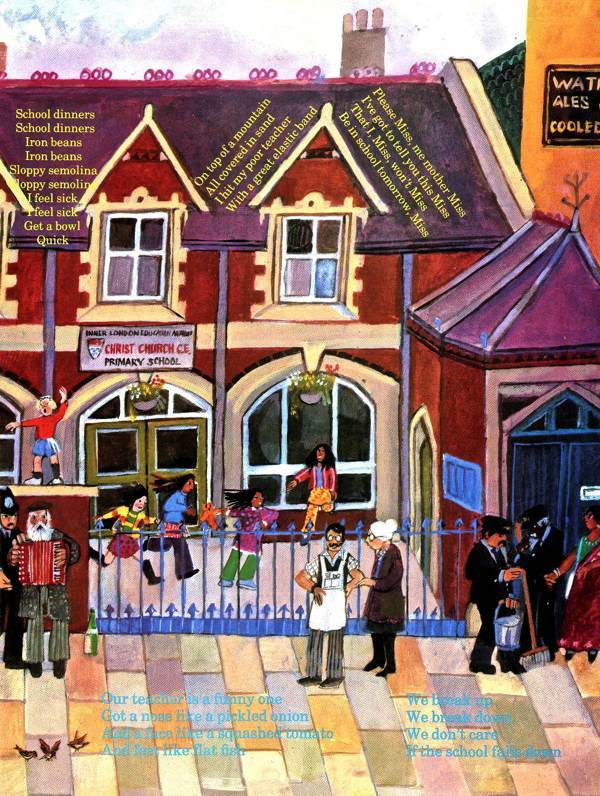 By contrast, I was especially delighted to Learn that Twinkle, Twinkle, Little Star was written by Jane and Ann Taylor in Islington in 1806 and to discover the Bengali version recently recorded by Dan at Bangabandhu School in Bethnal Green. Living in Spitalfields, surrounded by old buildings and layers of history, I am always fascinated to consider who has been here before. You have read the tales of the past I have collected from old people, but Dan’s work reveals an awe-inspiring historical continuum of much greater age. There is a compelling poetry to the notion that the oldest thing here could be the elusive and apparently ephemeral games and rhymes that the children are playing in the playground. I love the idea that these joyful rhymes, mostly carried and passed on by girls between the ages of eight and twelve – marginal to the formal culture of society – have survived, outliving everything else, wars and migration of people notwithstanding. Great work & story! Me as a Children’s Book Collector too, would love to visit Mr Dan Jones! Perhaps it would be possible next year. I am planning to travel to London & England then. Have a look at my site for more about all this! Oh my goodness! 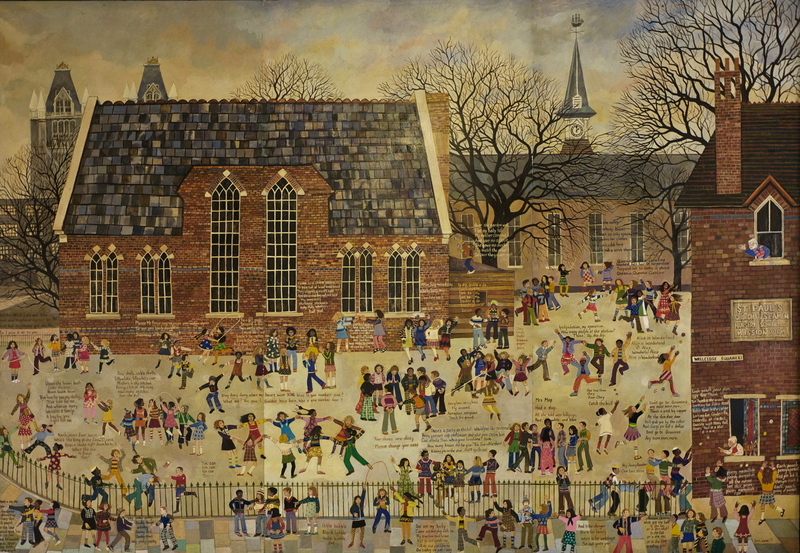 The painting is gorgeous, and following the singing playground links took me back 70 years – to my long-lost Scottish childhood. Thank you Dan Jones. I remember a very long version of the Jeely Pieces song; that, and Fitba’ Crazy were our favourites.